When the holidays roll around, everyone starts to panic about hosting family gatherings. How to feed all of their guests? How long will they all stay? How to keep all of the different ages entertained? A little planning goes a long way when it comes to relatives and holiday get-togethers. Politely ask for final RSVPs a week or so before the date; that way you can get a good grasp on how many will be attending, what ages will be there and how to feed and entertain them. Then, plan some special meals and fun activities so that you can make the most of the time with your loved ones. This top ten list of holiday games for every age will help make your family get-togethers a little merrier. An entertaining and family-friendly game that is simple to play and sure to bring laughter to every aunt and uncle at your holiday party. Players are rewarded on their quick answers and sharp responses. Play your way through 300 seemingly easy topics such as “name three dog breeds” or “name three super heroes.” You may know the right answers, but when you only have five seconds to answer, players get tongue-twisted and end up with some hilarious answers. The game includes 150 two-sided cards, and a twisted timer for added fun. Find it at major retailers like Amazon and Target. We all know that when relatives get together for the holidays, it can turn into a virtual zoo. Here’s a chance to let them really sound like one. As your guests arrive at your home, give them an index card and have them write down their favorite animal on one side and four numbers between one and 30 on the other side. Then, let the craziness begin. Throughout the gathering, call out random numbers between one and 30. When guests hear one of the numbers that they wrote down, they have to make noises and act like their animal. The first party guest to hear all four of their numbers and make their animal noises is the winner. This game will leave your guests “roaring” with laughter. There are times when you really want to thwack your relatives and Glow Battle is one of those games that encourages just that. 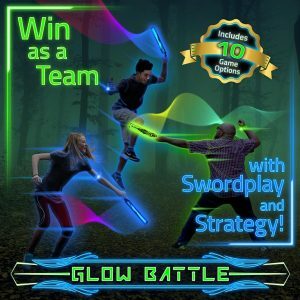 Players use strategy, teamwork and and their own warrior instincts to team up and take down their opponent using harmless, glowing foam swords. Teams are designated by different colored LED bracelets have a base to “recharge” after they get hit. Pit cousin versus cousin or uncle versus aunt in this thrilling glow in the dark battle. Available for purchase here. If your relatives like to shake their thing or you just need to loosen up your holiday happenings, then turn up the tunes. You can find the Just Dance game compatible with many game consoles or you can make up your own dance competition with a fun playlist of songs. Have a dance-off between cousins or have a family dance tournament. You can even create a silly Just Dance trophy for the winner to pass down from year to year. Need a silly game to put even the grumpiest grandpas in a good mood? This is the perfect choice. This hilarious game combines crazy accents with even crazier phases to create senseless sayings and a lot of laughter. The game comes with 50 accent cards and 450 phrase cards to combine and act out. One player is chosen as the Nonsense Judge each round and gets to decide which combination is the funniest. Watch as your family and friends become masters of improv. You can find it here. This game is like charades, only one person does the guessing and the rest of their team acts out a phrase. Before your party, write down funny holiday phrases on small sheets of paper and place in a bucket. Get creative and think of group actions like “pilgrims eating turkey” or “shoppers fighting over a sweater at a sale” or “Macy’s Parade.” Then, divide your group into two teams and take turns drawing a phrase. One player from each team has to guess while the rest of their team acts out the phrase. Set a time limit and then give points for right answers guessed within that limit. 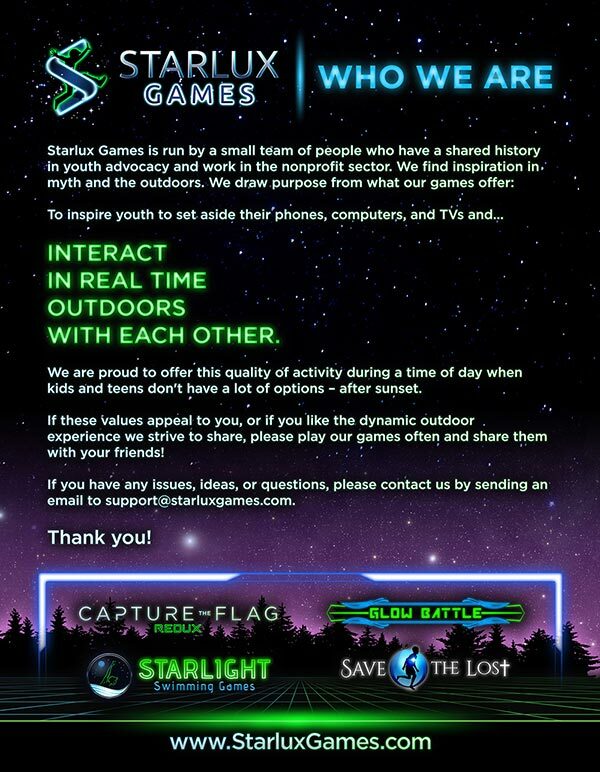 Gather your holiday crew and head outside for an exciting game of Capture the Flag revolutionized with futuristic glow-in-the-dark lights. Just like the traditional game, players split into teams and then work together to break teammates out of jail, sneak into enemy territory, protect base and steal the flag. 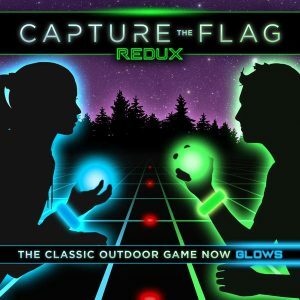 But unlike the classic, the flag is now a glowing orb and players wear color-coded LED bracelets to differentiate team members and glowing jail markers. Available for purchase here. When you’re feeding a crew for the holidays, you’re sure to have some extra paper plates around to use for this game. Give each of your guests a paper plate and tell them to put it on top of their heads. Then, give each of them a marker or pen and describe a specific holiday item or scene and have them draw it as you tell about it. You can describe a cornucopia filled with fruit or a scene where Santa comes down the chimney. Then have everyone hold them up to see who drew the best and the craziest. Before your holiday get-together, write down the names of some famous folks on blank stickers. As your guests walk in the door, place a sticker on their back so that they can’t see it. Then, they can ask other guests only “yes or no” questions until they figure out who they are. Give everyone who figures it out a small treat or prize. When your holiday party calls for after-dinner entertainment, pass out some pencils and paper around the table for this fun and easy game. Take turns letting everyone be the judge for a round. That person names an animal and everyone else at the table has six seconds to draw it. The judge then decides who wins that round based solely on their opinion so family politics is totally allowed. You can even trade your vote for the biggest piece of pumpkin pie! 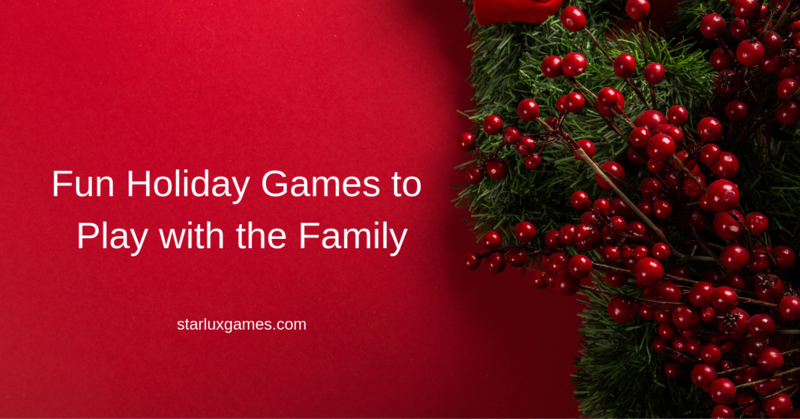 What holiday games do you enjoy playing with your family? Please let us know in the comments section.